Vesper-On Games decided they wanted something a little bit different for their game, Carnevale. Not specifically fitting into the usual genres of Fantasy, Sci-Fi, or even Steampunk, they have decided to make a world that's rather unique to just them. TGN guest reviewer, Sean Dooley, takes a look at much of the game's line and lets us know what he thinks on the subject. 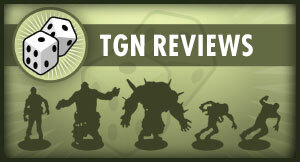 So grab your accordion and your gondola tickets, it's time for another TGN Review. This time, it's Carnevale. Sean: Living in Cincinnati has its benefits. I find myself pretty fortunate that I’m within easy driving distance of Gen Con and Origins. While Gen Con is the massive juggernaut of gaming, Origins has always been a more intimate setting, where I can check out smaller press games and companies. It’s at Origins 2012, where they were nominated for Best Miniatures Rules, that Vesper-On Miniatures initially caught my eye with their Carnevale line. That piqued my interest and got me digging into Vesper-On’s Carnevale line, both due to the miniatures they produce as well as the rule set they’ve created. Carnevale takes place in a late 18th century Europe rife with conflict and change. Instead of being marked by war or revolution, the world is forever changed by a ‘rent in the sky,’ flooding the earth with a supernatural force and creating a Europe quite different than the one we know. Carnevale finds its home in Venice, a city of mystery and intrigue, commerce and corruption, and since the rent in the sky’s appearance, a city of supernaturally gifted people. Carnevale’s miniatures are a diverse collection, spread across six distinct factions that inhabit the universe, and a seventh “faction” of independent characters. All the figures are cast in high quality white metal. The metal and casting quality of the miniatures is high. As typical of most Spanish miniature producers I’ve had experience with, the models have very little flashing and clean up incredibly easily due to the softer white metal being used. They do require a good soak in a warm soapy bath before assembly, but the quality of the casting and metal provided is above average. Though the casting quality and metal quality is high, the actual sculpting and design of the miniatures is a mixed bag across the factions. Of the four factions I’ve worked with, The Guild is probably the strongest faction overall in regards to sculpting and design. The Venetian Citizens, sculpted by Angel Terol, are well produced 28mm citizen models that would fit well in many other games. The Pulcinellas and King Pucinella are also incredible and are probably my favorite pieces from the faction, while I’m sure Assassins Creed aficionados will be drawn to the Capodecime. Again, the Guild is, as a whole, a really well produced faction and is one that I really enjoy. The Doctors of the Ospedale faction is probably the second strongest in terms of design and execution of sculpture. They are led by one of my favorite miniatures in the entire line, the Rhino. A hulking piece of metal that fills up the entirety of a 50mm base, the Rhino model is really well executed. The Nurse model, sculpted by one of my favorite sculptors (Patrick Masson), is another great looking, if not quite creepy, miniature. The Doctors, themselves, are pretty standard looking plague doctors; there are some better looking plague doctor models out there that I’d probably substitute in were I to field a Doctors army. The Madmen are probably the weakest models in the faction. But again, they’re not bad and would actually work well with other games that need some crazy people running around. The Patricians are a solid faction in overall design. They’re all fashioned around standard historical Venetian aristocracy, and as a whole, they’re well sculpted. The white collar thief, obviously channeling an 18th century Catwoman, is easily my favorite figure in the faction. The Black Specter, which I unfortunately haven’t gotten my hands on yet, is also solid. There are no real weak links in the Patricians, and like many of the models in the aforementioned two factions, the Patricians could be used in lot of other game systems as well. Unlike the other factions, the Rashaar are fairly unique to Carnevale and have some of the strongest and weakest miniatures of any of the factions. The Cult of Dagon starter set is easily the strongest starter set that I’ve worked with. The Preist of Dagon, Slaves of Dagon, and Officiants of Dagon are all well scaled and well sculpted human miniatures. The Slaves, despite the fact that they’re ‘only’ barely dressed human models, are the best of the bunch. The musculature of the minis just looks ‘right.’ While the Cult of Dagon starter is my favorite of the starters, the Rashaar also have the weakest of the starters in the standard set. The Ugdru-Rashaar and Magi-Rashaar are both mediocre models.The Ugdru-Rashaar will probably be better once painted, but I was really frustrated by the half ball and socket joins for the arms. It left some weird bumps that needed to be green stuffed over. The Magi-Rashaar reminds me of a vampire Aquaman, and as such, I’m just not a huge fan of the model. There’s nothing technically wrong with the sculpt. I simply think it’s a bad design. The Hybrids, however, are terrible. They’re ugly models that seem out of scale with the rest of the line. The female Hybrid is strangely squat and is, I’m fairly certain, groping herself. The male Hybrid is a strange Napoleon look-alike. They’re bad, and that poor quality is really obvious as the other half of the faction is so good. The Independent Characters are good overall, with the real winner being Jacques-Alexander Gillois’ Origins Award nominated Aberration. The 14-piece miniature was a bit tricky to put together, but it’s totally worth it. I’m not usually one for big tentacle laden monsters, but I’m making an exception for the Aberration. The model has great motion to it, convincing musculature, and once assembled, required very little greenstuffing to hide any gaps. He’s great! While the visual appeal of Carnevale will draw many in, I believe it’s the robust rules that Vesper-On have created that will keep people invested in the game. Vesper-On touts Carnevale as a ‘cinematic game’ (and yes, I hear you chuckling at Games Workshop’s use of ‘cinematic’) and the way the games unfold really support this. Carnevale is at its best when being played utilizing Adventures (their name for scenarios), and especially when those adventures are linked together as part of a larger campaign. The campaign system is incredibly robust, with characters growing throughout the game in multiple ways. Models can improve their character statistics and even gain new supernatural powers, thanks to the Rent in the Sky. Models that fall in an adventure suffer negative modifiers to their character. My group only played a short five adventure campaign, but we really enjoyed how the campaign system created a sense of continuity throughout our games. It allowed us to name our characters and really invest in them through the RPG aspects a campaign affords. The Campaign system would be a moot point, however, if the actual game mechanics were poor. Happily, this is not the case. Carnevale operates on an alternating activation system progressing over a course of rounds. Each round is comprised of individual turns where each player can elect (or even decline) to activate one model. It’s a pretty standard alternating activation system, aside from the ability to decline a turn, which is only allowable if you have more models than your opponent. This simple change is actually a really nice wrinkle to the system that allows for a bit more tactical decision making. For all resolutions in the game, Carnevale utilizes 10 sided dice, a die type that I actually prefer. The d10, to me, allows for a bit more variety in your results than a d6 and seems to be the dice of choice for many new miniatures games. In addition to using the d10, Carnevale also employs a ‘special’ d10 called a Destiny die for every roll that is made. Destiny dice are treated the same as regular dice, save for when you roll a 10 (a critical success) or a 1 (a fumble). When either of these situations occur, something extraordinary or dire happens. Fumble a combat roll and your opponent gets to make a free strike. It’s a little complicated but does add some diversity to your dice results and makes that Destiny Dice all the more important. Adding one more wrinkle to the resolution system is Karma. Karma is used primarily to cast spells. But for dice rolls, Karma can be used to increase your chances of success by adding more dice to your active pool. Conversely, defenders can also utilize Karma points to further protect themselves from damage. These decisions have to be made prior to making a roll. This creates a risk-reward system that is actually really fun to use, especially as any character with a fully depleted pool of Karma automatically receives a negative modifier to all rolls. Overall, the resolution system is clean, if not a bit complex at times. In the rules, successes are unnecessarily called “aces.” I’m not sure we ever actually called them aces in any of our games. The Karma system adds some complexity to the game, but it’s not so much that a novice would struggle with it. Resolving any combat is simple enough that it makes the game play relatively quickly, but there are enough interesting tactical decisions to make it fun. That’s not to say there aren’t some areas of Carnevale that seem a bit convoluted. There are a lot of different actions one can perform using their AP, perhaps more than you’d want to introduce to a new player. We stuck with the basic movement and combat actions for our first three games. That eased us in enough that adding in the advanced maneuvers in games four and five not only fit, but added some really rewarding decisions to our arsenal. Additionally, there are a LOT of “Universal Abilities.” The only place to find them is in the primary rules, so you have to keep them handy if you’re not willing to commit them to memory. It’s not a huge deal, but flipping back and forth in the rules did take some additional time for us and slowed the game down a touch. Overall, Vesper-On has a lot more aces with Carnevale than it does fumbles. The miniature lines are solid, and based on what they’re showing with the two newest factions (the Vatican and Strigoi) in their Kickstarter project, they’re continuing to get better. The rules are clean, fast, fun, and offer a really fantastic and robust campaign system that might be my favorite miniatures campaign system since Necromunda. Whether you want to socialize with high society and the Patricians, experiment in hidden laboratories with the Doctors of Ospadale, or summon terrors from the deep with the Rashaar, Carnevale has something for everyone. With a Kickstarter project in full swing, there’s no better time than now to be whisked off to the mysterious canals of Venice, but beware the Rent in the Sky!